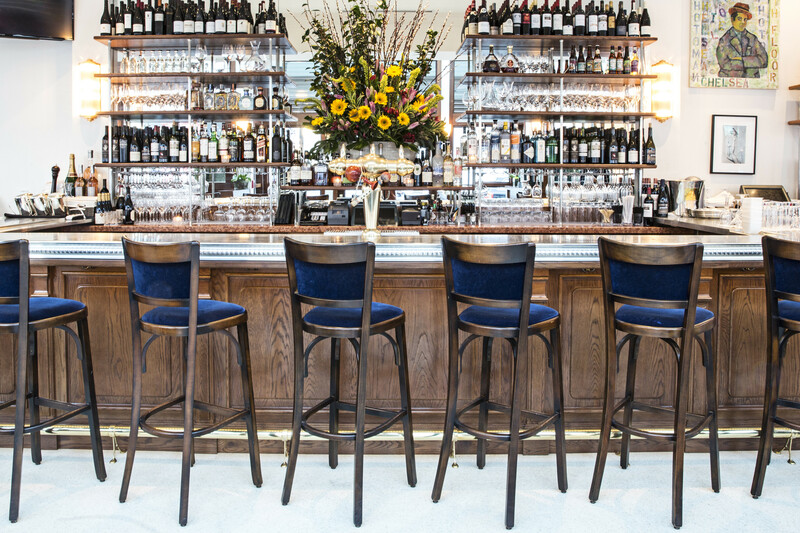 A chic line-up of contemporary barstools perfectly complement the oh-so-French pewter bar top at Le Bilboquet’s newest outpost in Atlanta. If you live in New York City, you’ve probably dined at Le Bilboquet. If not, you definitely know its façade distinguished by dark green awnings with its name marked in swanky cursive. 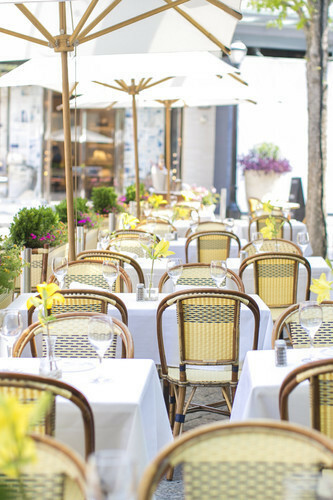 The French eatery has been an Upper East Side staple since its opening in 1986, and has remained a hot spot even after a relocation in 2013. In the fall of 2014, the buzzy French café took its traditional bistro-vibe and to-die-for Croque Monsieur down south, with an outpost in Atlanta’s buzzing Buckhead neighborhood. Nestled in the center of the upscale shopping mecca, the freestanding bistro looks more like a sidewalk café in Saint-Germain than a restaurant in the peach state. For the quintessentially-Parisian interior, Le Bilboquet’s founder Philippe Delgrange tapped the designer of his original location, Carolina von Humboldt of CvH Interiors. “Le Bilboquet is a casual French bistro with the same atmosphere that makes such a location unforgettable in Paris,” noted the designer, a Paris native. In the French tradition, people-watching is part of the meal." Such an atmosphere is created by keeping with the French tradition of making sophisticated interiors seem laid back, or laissez-faire, if you will. The sun-blasted space, courtesy of a wall of floor-to-ceiling windows, features classic white-clothed tables accompanied by cozy blue velvet banquettes and coordinated wooden seating. Matching stools belly up to a traditional pewter bar set up in an inviting U-shape, with a steady arrangement of fresh flowers on view. The dual-toned terrazzo floor takes a cue from the restaurant’s original location with a subtle change in color to better fit its cheerful locale. “We needed a lively pavement to warm up the space,” said von Humboldt. Contemporary fittings pleasantly offset the long-established aesthetic, specifically a display of modern artwork from both local and renowned artists. “My goal and motivation is to create an atmosphere people want to revisit,” explained von Humboldt, “not only for the food, but to be surrounded in simple elegance and be pampered as such.” Here are five ways the designer imparted très chic style onto Le Bilboquet’s sunny interiors. 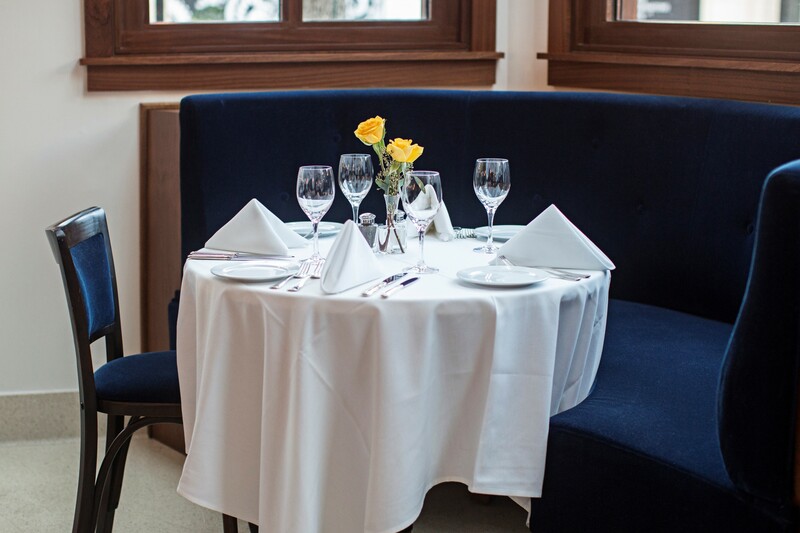 Traditional banquettes covered in rich blue velvet line the perimeter of the modern French bistro. Of the importance of being elegant von Humboldt spoke like a true Francophile, noting, “it never fades, and is never too much or not enough.” To keep this sense of formality and sophistication, the designer appointed the main dining room with rich textures, like velvet-upholstered seating, warm wooden tones, and a classic pewter bar top. Von Humboldt’s favorite piece of décor in the space is this sizeable mirror created with decorative painter Marianne Jacquemin. Perfect for people-watching—like the Parisians do. The sprawling sidewalk dining area features traditional table settings accompanied by rattan bistro chairs. “In the French tradition, people-watching is part of the meal,” said von Humboldt. The designer worked with decorative painter Marianne Jacquemin to created a large-scale mirror on the restaurant’s back wall to abet in just this. The statement piece is composed of Venetian plaster and gold leaf, and becomes an immediate centerpiece of the room’s décor. 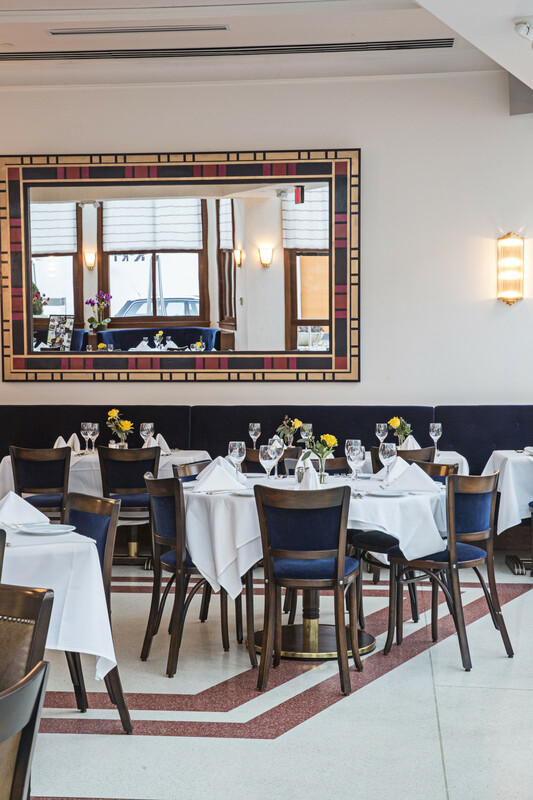 “The special atmosphere of French bistros is very much related to the interactions in the room,” explained the designer, “how people look and dress, who is there—and all this eye-wandering should be subtle.” Hence, the mirror. To add a bit of personalization to the airy interiors, von Humboldt did some searching. She picked vintage brass fixtures to softly illuminate the bistro, and enlisted the talents of an eclectic lineup of artists to spruce up the neutral walls, namely a stately interpretation of an American flag by painter, Peter Tunney, and photography by Christophe von Hohenberg. “The world is full of pretty pieces waiting to be discovered, rediscovered, reinterpreted and combined,” she said. 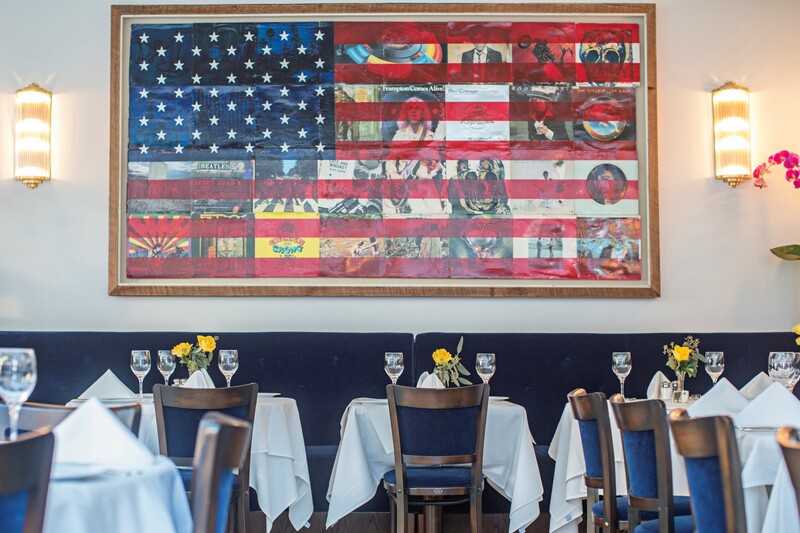 American Flag by Peter Tunney hangs in the main dining room. First and foremost, the designer wanted visitors to feel comfortable and cozy. To exact a successful design the essentials have to be perfect. For von Humboldt this is simply creating a space that is, “well-seated with the right light.” There was a lot of sunshine pouring into the restaurant, almost too much, so she employed crisp cream shading on the windows. The space has ample seating, which makes it feel welcoming and roomy. Our ideal oasis: spending days sipping rosé alfresco on one of the many rattan bistro chairs on Le Bilboquet’s front patio.